Woody Allen is always intensely creative, and prolific. The style and content of his films vary greatly, yet he is often accused of repeating himself. If there is any truth to that, it's because he is a true artist. Just like a painter might have an affinity for certain colours, or a liking for certain subject matters, Woody Allen is exactly the same. His much derided English films were seen by many as him finally and forever losing his touch - but as he gets more used to working abroad, he gets better. Recent films such as 'Vicky Cristina Barcelona' and 'You Will Meet A Tall Dark Stranger' were fabulous films. His first European films were always going to be difficult -- Allen is known to struggle outside of New York, and he dislikes sunshine, and he prefers, where possible, to work with the same trusted crew members on his projects. When he came to Europe, everything was different. You could say he came to London, and then other European countries, because these were the only places still willing to fund his films. And that would possibly be true. 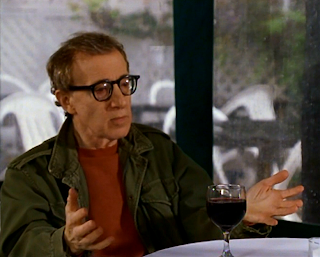 But another factor is that - Woody Allen always challenges himself. After 'Bananas' and 'Sleeper', he had a style which guaranteed success and fame. Instead of continuing in that vein, he made more literate films like 'Annie Hall' and deeper, dramatic films, such as 'September'. This is a writer and director who is driven by his vision - by his never ending creativity and determination to make a perfect film. I find Allen's films from the 1990's to be particularly fascinating. He made a black and white noiresque comedy, inspired by the German expressionists called "Shadows and Fog", he made an all star musical starring Drew Barrymore, Ed Norton, Goldie Hawn and Julia Roberts, called "Everyone Says I Love You", and he even made a film that featured a Greek choir throughout, called "Mighty Aphrodite". It says a lot about his body of work that those aren't even the films I'm going to talk about. 'Husbands and Wives' was Woody Allen's last film with his then long term girlfriend, Mia Farrow. While many of the films he made with her can undoubtedly be called masterpieces, it's my feeling that the intensely creative period in the years after they broke up were Woody's best (so far). In fact, I would say that period began with 'Husbands and Wives' which is hardly surprising as their relationship began to full apart in the middle of production. The film is an intense, high-energy film about relationships-- and it's a film in which Woody threw out all the rules of filmmaking. The opening scene is as fascinating an opening scene as you could hope to see. Everything is told in single master shots -- there's no cutting (to different angles) although he chooses to have sharp, abrupt cuts, moving the action along. Usually when you watch a film there are smooth and natural feeling edits, whereas here Woody is happy to cut mid-sentence to move things along. It's jarring at first--- but within minutes, you forget it's happening. Woody creates a new film language and makes us enjoy it, all in a matter of minutes. It is also memorable because of the fantastic visual style created with his long term collaborator, Carlo DiPalma. The three films I am focusing on were, in the end, a great way to end his career and, as it turned out, his life. The camerawork is handheld, often shaky; in fact, a complete mess, much like the characters in the film. "I've always been thinking that so much time is wasted and so much is devoted to the prettiness of films and the delicacy and the precision. And I said to myself, why not just start to make some films where only the content is important. Pick up the camera, forget about the dolly, just hand-hold the whole thing and get what you can." 'Manhattan Murder Mystery' is my favourite Woody Allen film. His maturity as a comedic writer, director, and actor, has allowed him to makes films like this where the laughs are so constant, and so cleverly constructed and presented -- that most of the time you don't even realise you're laughing. Woody is the master of slipping in something funny and not drawing attention to it. The funny line is presented as straight as the straight line. And if you don't find it funny, he doesn't mind, because he's on to the next joke. I saw his most recent film "You Will Meet A Tall Dark Stranger" and found it quietly hilarious even though, on the surface, it isn't even a comedy. As a director he's a lot more self-assured than when he made films like "Take The Money And Run" and "Bananas". '..Murder Mystery' is a film that warms my soul and fills me up with smiles and laughs in a way no other film can. Once again, Brian DiPalma shot the film handheld, in lengthy single takes. This gives the actors great freedom. In the scene below, we see the characters in a restaurant scene. And it's all played out in one shot. Much like with 'Husbands and Wives', look at how the characters communicate and relate to each other. There are subtle disagreements, jealousies, and we see Alda flirting with Keaton right in front of Allen's eyes. 'Deconstructing Harry' is a film that shows Woody Allen at his experimental best. When you say 'experimental' about a film director, it normally implies some good and some bad. But here, Woody is so confident and competent in what he's doing that it feels completely natural. The sharp cutting techniques of 'Husbands and Wives' are used here again, but to even wilder extremes -- we see characters appearing in different parts of a room, we jitter back and forth in time, and we zip through scenes and dialogue in a lightning fast way. "If I am dealing with a very neurotic character, I like to cut neurotically. I like the cuts to be atonal or asymmetrical and not balanced. So I just cut when I want to cut, and keep it moving very fast, and jump when I want to jump". Here are some actors who appeared in the film: Robin Williams, Billy Crystal, Paul Giamatti, Stanley Tucci, Tobey Maguire, Demi Moore, Mariel Hemingway, Judy Davis, Kirstie Alley. The list shows his amazing ability to attract the best actors, as well as discovering new talents (Maguire and Giamatti were not widely known at the time). It is also a testament to the talents of Woody Allen than a major actor like Robin Williams was willing to take a small part in the film where he would be out of focus the entire time (you don't get to see Robin clearly at any point). 'Deconstructing Harry' is so alive. At the time of production, Woody was well into his sixties -- yet rather than making comfortable and predictable films (i.e. guaranteed successes) he was making films like this. It is also a marked departure from his usual on screen character. Sure, there are massive similarities -- but there is also a coarseness and bitterness that we hadn't seen previously in Woody's films. The language and sexual scenes, again -- a world apart from films like "Annie Hall" and "The Purple Rose Of Cairo". It's hard to do the film justice in a blog post and a YouTube clip-- but having a watch of this scene will give you an idea of the creativity of Woody Allen. It reminds me of the first time I saw Chaplin's "Modern Times", it was full of rich ideas and comic developments. Here, again; we see many sides of Woody -- his finely tuned screen presence, his simple and unobtrusive camera-work, and his risk taking. 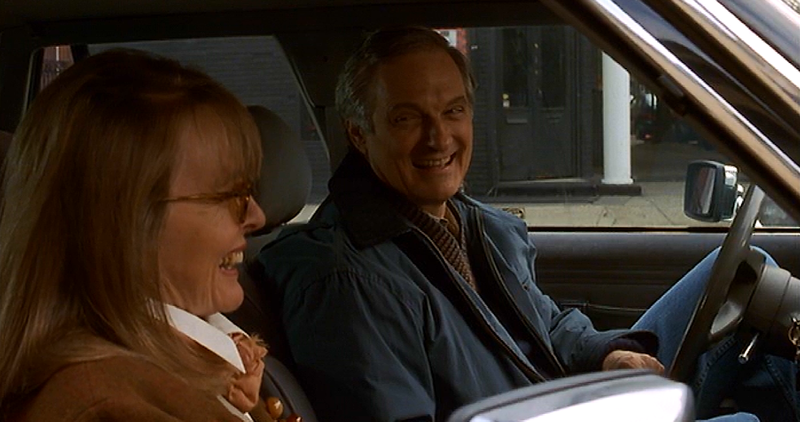 This is the character Harry Block, high on pills, miraculously out-of-focus, and making great jokes about Hitler. 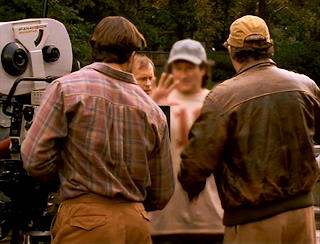 You'll also see a favourite technique of his -- to have characters speaking outside of frame (he first did this when working with cinematographer Gordon Willis, who showed Woody how characters don't necessarily have to be in the shot to have an effect on the audience). When writing about Woody Allen -- whether it's about his writing, his acting, or his private life, people are always looking to pigeonhole him. But the truth is, he's an artist with a diverse and eclectic filmography. He has bad films, average films, and masterpieces. And the good thing about his work is that, even if you hate what he just did, he'll be back with something again next year. Thanks for the excellent post. I did not remember Paul Giamatti was in "Deconstructing Harry." Your admiration for "Manhattan Murder Mystery" makes me want to see it again. Often when I re-watch one of Allen's films, I feel like I'm seeing it for the first time. After reading this post and seeing the care and effort you've obviously put into it Kid, I'm embarrassed to say that I've never watched a Woody Allen film! I think it's time I put that right so I'll probably start by watching Deconstructing Harry and Annie Hall. I'll come back and let you know what I thought.